It’s not easy finding a home for a fearful dog. It’s even harder to find a home for a fearful dog who comes with her own cat – but the Berkson family is determined to make it happen! The German Shepherd was extremely fearful of people and would not let Myka or anyone else near her. But not long after spotting the dog, Myka saw a small black kitten who approached her, and when she did, the dog followed. 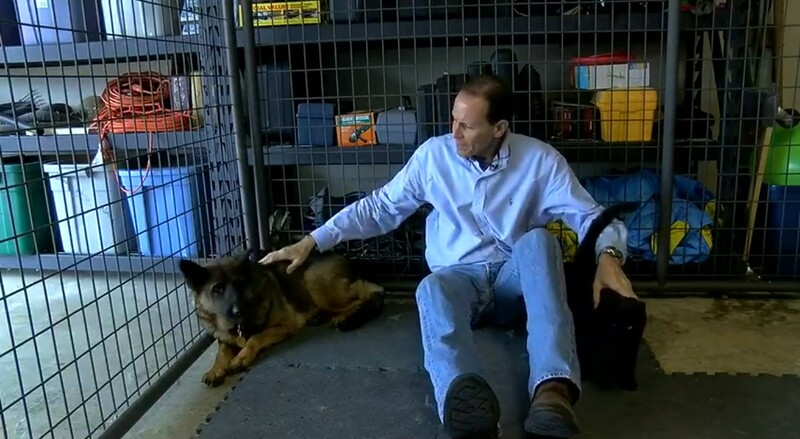 The Berksons are experienced in pet care, especially with German Shepherds. The couple currently has five dogs, including their fifth ever German Shepherd. Myka previously ran a volunteer rescue group and she and Andrew were both active in finding homes for pets in need. Experience told them that though the dog would be a challenge, getting her off the streets was possible. Twice a day for four months Andrew and Myka Berkson returned to the area to feed the cat, who they call Gizmo, and the dog, Libby. Gizmo proved to be much less guarded than Libby, but the couple decided they would not take one without the other, as they appear to be bonded. Even after four months, Libby would not allow herself to be touched. The couple had tried to trap her, but she proved to be too clever for tricks! It became clear that she would need to be sedated to get her to safety and away from the highway. Click here to see the video at KLTV.com. The Berkson family absolutely loves German Shepherds, but both Andrew and their daughter are allergic to cats. Though they could keep Libby and find a home for Gizmo, they believe the two are bonded and belong together. They’re looking for a home where both Libby and Gizmo are welcome. The Berksons estimate that Libby is about five or six years old, and Gizmo is nine months old. “Gizmo the cat is just a joy and is easy. Libby is really a work in progress and is going to take a lot of time, patience, love and a very gentle touch. We don’t know her history but think she was probably abused in the past and has trouble trusting people. Not at all aggressive but scared. “Interestingly, we were able to put our hands in her bowl while she ate and stroke her muzzle but were never able to pet her or catch her. She is very smart and cautious. The ideal home will have space to play, and loving people who can show Libby gentleness and patience. Can you or someone you know give Libby and Gizmo a forever home? Interested parties should contact the Berksons at tylercatanddog@gmail.com.